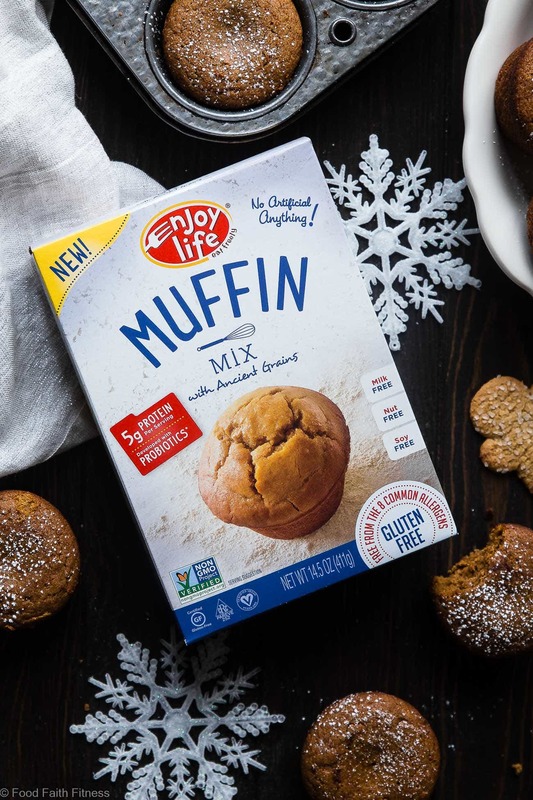 Just wanted to let you know that the best healthy gluten free gingerbread muffins EVER are sponsored by my friends over at Enjoy Life Foods! 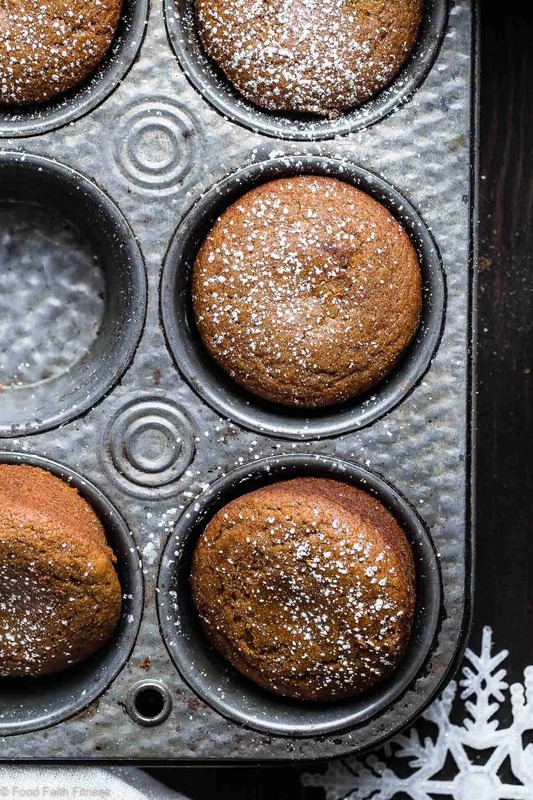 This truly is the best healthy gingerbread muffin recipe! And they’re dairy and egg free, vegan friendly and only 5 ingredients too! There are just 5 simple ingredients standing between your face and PERFECTLY spiced, totally sweet and PILLOWY SOFT muffin DREAMS. For REAL internet friends. These little bites of healthy gingerbread BLISS are exactly what food-dreams are made of. EXCEPT THEY ARE A REALITY. <– !!!! I’m not going to lie to you. I am a SUCKER for anything gingerbread – gingerbread high protein oatmeal for breakfast, gingerbread gluten free biscotti with some coffee or some healthy gingerbread blondies to end the day with a little dessert. WANT IT NOW. ALL THE TIME. Spoiler alert: there’s more gingerbread coming on Wednesday and you are NOT mad about it. I know it. 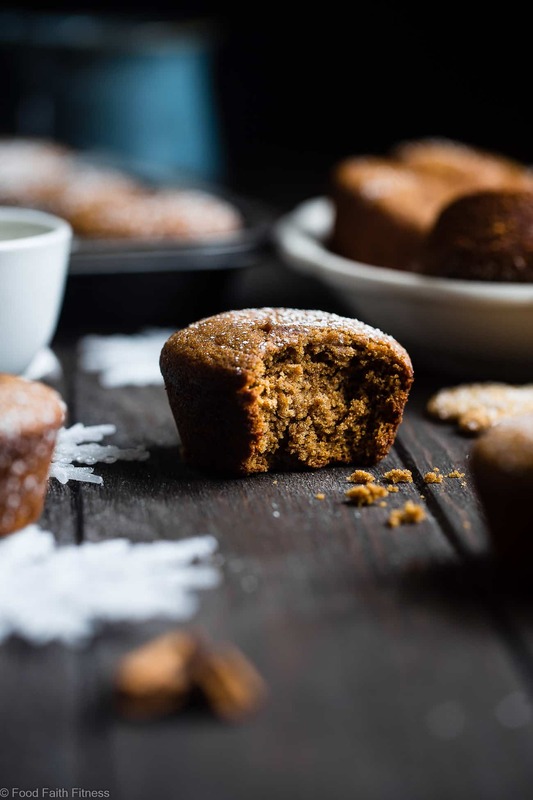 There is something just so magical about how the marriage of sticky-sweet molasses and warm-and-cozy cinnamon and ginger spiciness just CULMINATES ALL THE GOODNESS that is the holiday season into ONE BITE of Christmas-tasting HEAVEN. I’m pouring myself a cup of coffee, cuddling up by a crackly fire (which could also be the fireplace channel on TV because how to light a real-person fire is BEYOND MY SKILLZ) with a cozy blanket and going FACE FIRST into one of these FLUFFY ginger muffins RIGHT NOW. Such good mental pictures friends. Told ya. 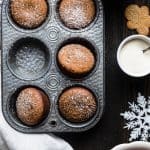 They ARE the EASIEST and BEST healthy gluten free gingerbread muffins. EVER. How-EV-ER, the TRU secret to making perfectly pillowy-soft muffins with VRY VRY minimal ingredients is Enjoy Life Foods Muffin Mix! This also makes them allergy free! Gluten free! Dairy free! Fun and delicious for ALLLLL. Again. 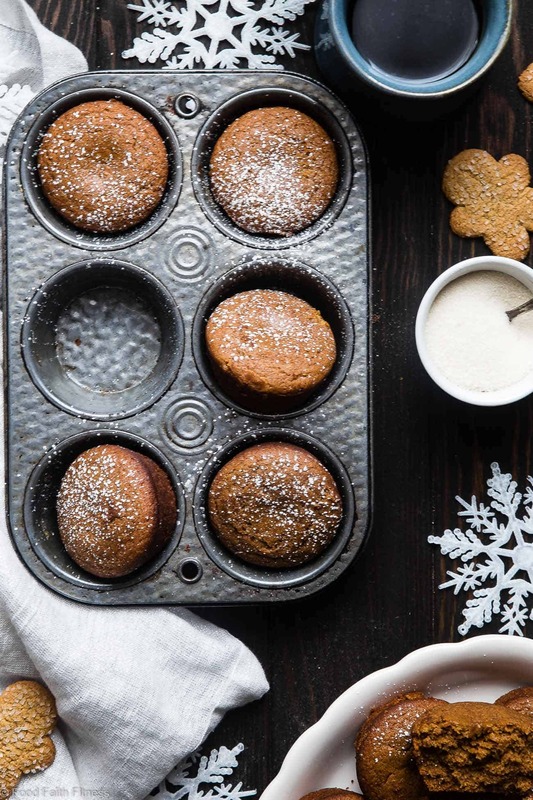 I repeat: they ARE the best gingerbread muffins in the sense that A. YUMMY and B. totally all-inclusivist muffins that can be enjoyed by ANYONE, no matter their diet, this baking season. Aside from some super-fab-making-your-life-easy-muffin-mix, Enjoy Life Foods also has various kinds of chocolate chips and chunks that are certified vegan and paleo friendly for ALL your holiday baking needs. But, now I’ve planted the idea in your head. That was intentional. Just FYI. I mean, if you make these for Christmas morning (which, liiiike, you should!) a little creamy-dreamy chocolate drizzle action, combined with the perfect spicy-sweet, molasses-ginger-cinnamon flavor profiles can only make the day start off EVEN MORE magical. You could even make them from Santa, with a glass of almond milk, instead of some whipped gluten free shortbread cookies. Just kidding. Then you’d have to share. I’m all about the spirit of giving on Christmas. But, one can only go SO FAR. 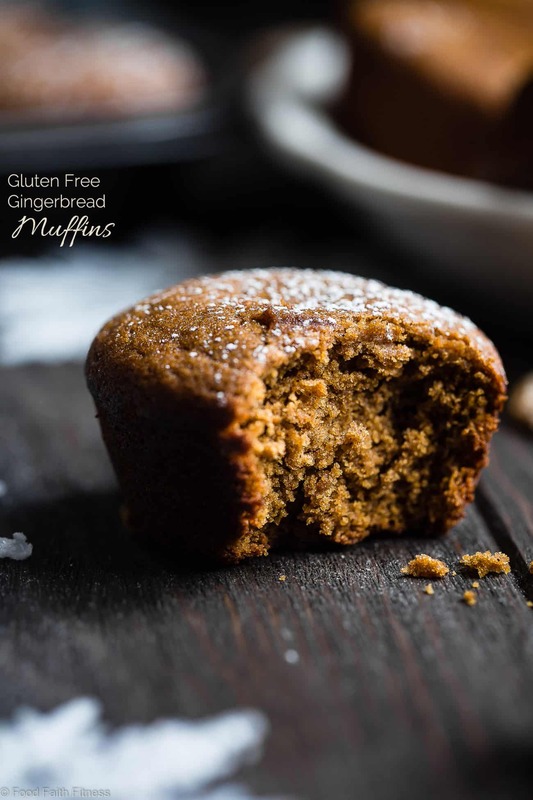 These truly are the best healthy gluten free gingerbread muffins! And they're easy, dairy and egg free, vegan friendly and only 5 ingredients too! Preheat your oven to 400 degrees and spray a muffin tin of cooking spray. In a large bowl, whisk together the muffin mix, ginger and cinnamon. Add all remaining ingredients and whisk JUST until combined - don't over-mix! Fill the muffin cavities 2/3 of the way and bake until a toothpick inserted in the center comes out clean - about 15-16 minutes. * Let cool in the pan for 5 minutes and then transfer to a pan to cool completely. *Your muffins will probably have a little dip in the center of the top - totally normal and the muffins are still perfectly cooked! Love these muffins! Perfect for the holidays! so ready to make these for christmas morning! My kids would love to wake up to these on Christmas morning! I would love them with my cup of coffee! Win-win! The best of both worlds! Thanks! 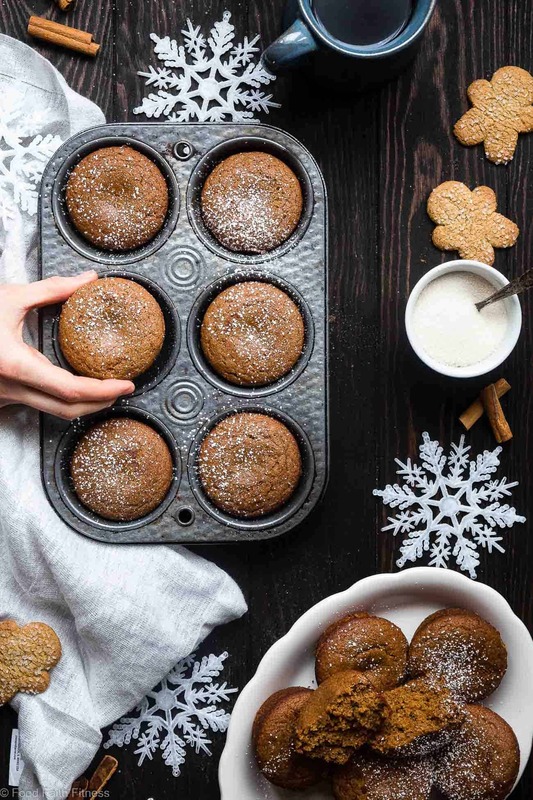 Totally in love with these gingerbread muffins! They look perfectly moist and delicious! Could you swap coconut oil for the olive oil? Gingerbread is the BEST. I will be enjoying it over the summer. NO SHAME. These muffins look to die for! I bet they were such a crowd winner! TOTALLY NO SHAME! Love gingerbread always! I have been craving gingerbread, haven’t made anything yet this holiday season. These are looking so good to me right now! You need to get on that Brenda!